Underwriters' Laboratories of Canada's affiliate, Underwriters Laboratories Inc. (UL) is notifying consumers that a self-ballasted lamp sold under the brand name "DOLLARAMA" bears a counterfeit UL Listing Mark for the United States and Canada, does not meet UL safety requirements and poses a risk of fire or electric shock. 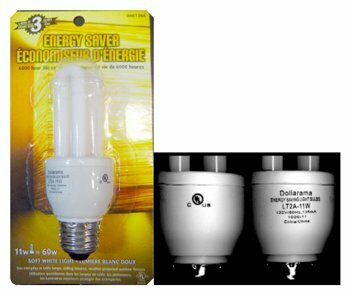 DOLLARAMA has removed all self-ballasted lamps in question from shelves and is asking consumers to return this product to stores for exchange or full refund. Manufacturer: The manufacturer of the product has not been identified. Hazard: This product has features that do not comply with UL's applicable safety standard and pose a risk of fire or electric shock. On the product: A counterfeit UL Listing Mark with the following information: "DOLLARAMA, ENERGY SAVING LIGHT BULBS, LT2A-11W, 120V/60Hz, 135mA, China/Chine" appears on the base of the product. On the Packaging: A counterfeit UL Listing Mark appears on the bottom right corner. The packaging cardboard is also marked with the descriptions: "ENERGY SAVER," "6000 hour life expectancy," and "SOFT WHITE LIGHT." What You Should Do: UL recommends that users stop using the products immediately and return them to the place of purchase. DOLLARAMA will replace counterfeit self-ballasted lamp with a Sunbeam compact fluorescent bulb or provide a full refund.